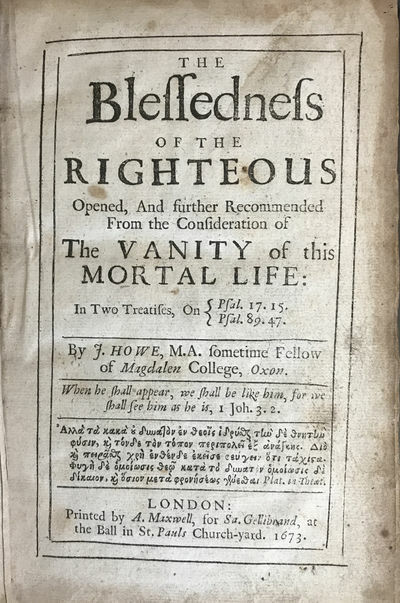 The Blessedness of the Righteous Opened, and further recommended from the consideration of the vanity of this mortal life: in two treatises, on [bracket] Psal. 17, 15, Psal. 80, 47. London:: Printed by A. Maxwell, for Sa. Gellibrand, 1673., 1673. Two parts in one. 8vo. , 514; , 92 [of 96] pp. "The vanity of this mortal life; or, of Man, Considered only in his present state." (96 pp.) has special title page. Original full mottled paneled calf; badly worn. Lacks 2 final leaves, binding pitted, corner showing, joints well worn, spine thread-bear, etc. Ownership signatures of John Dale, April 28, 1711; "Ex Dono. Sarah Browne." As is. "Howe (John), a learned English nonconformist divine, born at Loughborough in Leicestershire, of which place his father was minister, in 1630. The latter being afterwards ejected by archbishop Laud, on account of his connecting himself with the Puritans, removed with his son to Ireland, where they continued till the rebellion in that country obliged them to return to England, when they settled in Lancashire. . . Dr. Calamy says, that 'he was one of the great abstractedness of thought, a strong reasoner, and one that had a very penetrating j8udgement, which carried him as deep into a subject as most men ever went that handled it. . . There is an uncommon depth of thought in several of his works.'" - Encyclopaedia Londinensis, Or, Universal Dictionary of Arts, . . . 1811. p. 435.